Wordless Wednesdays: A quick peek to the RHS Chelsea Flower Show! Time is running sooo fast and I cannot believe that May is gone already! This is definitivelly the busiest time of the year for us and between the Chelsea Fringe, The RHS Chelsea Flower Show, the new collaboration with GROW London and the ongoing design projects, the hours of the day (and of the night!) are never enought! I wish I could bring you all in my pockets to share these exciting days with you! Due to previous work commitments, this year I couldn't plant in Main Avenue at Chelsea, but I was lucky enough to host for Luciano Giubbilei (Gold Medal & Best In Show) and the super Cleve West (Gold Medal). Here a little peek of the RHS Chelsea Flower Show 2014. More posts and photos to come soon! Thank you for stopping by! I hope to see you next week! Please feel free to repin from here or from my Pinterest board. Chesea Fringe lands to Italy! - Il Chesea Fringe atterra in Italia!!! 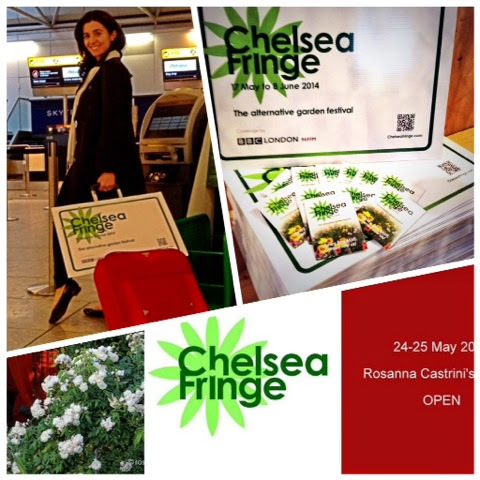 The Chesea Fringe Alternative Garden Festival starts today and on May 24th will land in Turin with the 'Little Fringers Grow' of Rosanna Castrini Landscape !!! Come back soon for more news and get in touch at info@mercurellisgardendesign.com for more info on how to join the Chelsea Fringe!